Supersessie van Andy Piper op Castle Lakes! For some of the regular readers of the site, let me just explain why a 2009 trip didn't happen, two of the regular anglers were under threat of redundancy from there jobs and Darrell my son became a father for the third time. Still the lads were now sorted with new jobs, one changed departments and one changed company's but doing the same job and I became a Grandad, again!!! Which of course meant that 2010 had to be a goodun!! The summer season here in Spain was well under way, Perry had to wait to build up some holiday from his new job, so it looked like it would be a late October trip. 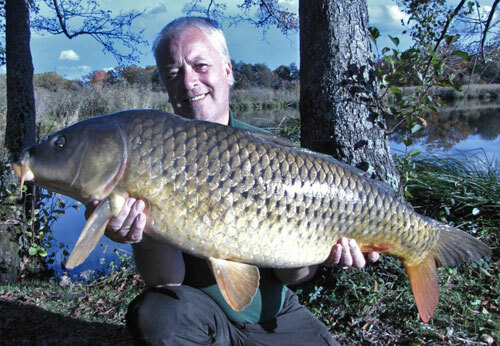 I quite like this time of the year in France as the lakes can be a lot less crowded with most anglers not wanting to book a trip at the end of October, they all seem to opt for the end of September or beginning of October. I can see why, as the lakes can fish very well at these times of the year, but if the weather holds up the end of October can be very productive too. Darrell gets a week break from teaching in Sweden at the start of November, Perry had a few days booked in New York with the missus during October so it seemed a good week to see what was available was week commencing Saturday 30th Oct to Saturday Nov 6th. So far we had me, Darrell, Perry and Steve up for it, Pete, who has been with us a few times was interested and a first for Vincey boy (Perry's brother, I always call him Vincey boy so shall carry on doing so) was also interested. That would be six in total. Pete had been to Castle lake before and had done reasonably well, it was in May a couple of years back but he also caught a good few smaller fish, but still enjoyed his week there. We checked out the website and I made a few enquiries by email to see if the week was available, it was, in fact they had no other bookings for our week. The phones between Spain, Sweden and the UK started to warm up, a bit of research on the net and we decided to book the week for the six of us. The good thing about this lake on the website is you can book the particular swim you fancy along with a view and some details about the water in front of that swim, a good bit of information if booking for this time of the year. Castle 1 is a fairly shallow but large lake (quoted at 50 acres) it does have a deep end and shallow end with 19 swims, we decided to book the swims at the deeper end of the lake, being it was this time of the year, if the weather did turn for the worse the fish could be held up in the deeper water. The preparation for our week had to start, we had ordered some prepared particles and hemp from the lake, along with the food package and a Bic row boat. Perry had spoke to Kevin at Mainline with our order for boillies, 10kg of New Grange each, along with some dip, paste and pop ups. Baitboats had been given an overhaul and I had split mine in half and made a couple of repairs then resealed the two halves completely. Steve had ordered a couple of new batteries for his, mine and Perry's baitboats as we felt sure these would help on a big shallow lake like Castle 1. Pete had a new bivvy for his birthday, a nice present from his missus, Vincey boy had a camo suite and some new rods, Perry had splashed out on some new rods and a bit of stainless. Steve, Darrell and me just bought a 'few bits' you know the sort of things we all buy when going on a French trip that cost a fortune but never end up getting used! I had to clean all my tackle, rods reels the lot as they do get a bit abused fishing the river Ebro here in Spain and as Darrell was to fly to Spain then travel up to the lake with me, he was to use spare rods and reels of mine for the week, along with one of my bivvies. We had hired a bedchair at the lake and Darrell was to bring his alarms, pod, sleeping bag etc. I had my car serviced so did Perry and Steve, Perry was to travel with his brother (Vincey boy) and Steve was to have Pete as his passenger, They booked their ferries and everything looked good to go. Castle lakes are located at St Jeanvrin, which is fairly near Chateaumeillant in the Centre region of France. As already said it's a big water of about 50 acres, it has 19 swims where 11 are along one bank. Swim number one is nearest to the facilities and is at the deeper end of the lake just off the dam wall with swim 11 down in the shallowest area at the far end. Swims 12 to 18 are on the opposite bank and are pontoons situated in the reed lined margins, I believe access to these is by boat as opposed to the main bank where you can drive to every swim. The last swim is situated on the dam wall at the opposite side to swim 1, this is also accessible by car. 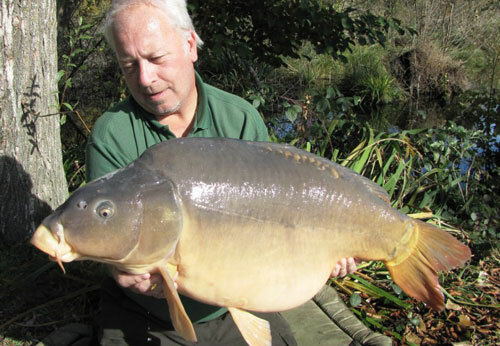 The stock of carp consisted of both commons and mirrors of varying weights from 20's to a few over 50, the record I understand for the lake came a couple of months before our trip with a mirror at over 69lb. So there was plenty of carp to go for, there are some poisson chat present but at this time of the year they were not going to be a problem. There is also bream, pike, perch and bass present, which all grow to a large size as Ron the fishery manager had informed us. We had decided to fish in three sets of pairs, now although we had booked swims 1, 2, 3, 4, 5 and 19. Ron the fishery manager had advised to fish the shallow water as opposed to the deep as some Dutch anglers had done well two weeks before we were going and better still no anglers were on the week before us or the week with us, so we had the place to ourselves. The usual draw for swims was conducted by Vincey boy (being the new boy he might as well get involved from the off) Darrell and I drew for first choice, with Steve 'n' Pete being second, that left Perry and Vincey boy last pick. Darrell fancied number 10 (this was on the advice of Ron when Darrell spoke to him on the phone the week before) that would mean I would be in 11. Steve 'n' Pete fancied the middle part of the lake, so went in 6, which isn't really a swim as it's a bit near 5 so it's used for keeping the boats in. That left the brothers grim in 19, Vincey boy liked the idea of the sun shining in the swim when we looked round the lake??? Most of the swims have beds of lilies within reach, but of course at this time of year they were well and truly on the wane as opposed to if we had been fishing during the summer, Darrell and I went out in the boat with my echo sounder to see if there was any variation in depth and type of bottom, we also wanted to check the areas by some lily pads and some marginal reeds to my left in the bottom bay. To be honest there wasn't a lot of difference where we looked or where we pushed around on the bottom, it was all a bit silty and of a uniform depth the main attractions were what was left of the lily beds and the reed fringed margins that had a few little inlets into them, this is where we were to fish. The others had been out to have a look round also and had come up with a very similar outcome to us. So that was it, a bit of baiting a few spots (four rods each are allowed) some markers put in place, baits on the rods to save time when we come back from our evening meal and off we went to get some grub. We got back from dinner wanting to get the baits out as soon as possible due to the light starting to fade fast, that is the only trouble with this time of the year, the nights are so long, meaning you need to have your evening meal that much earlier than you would during the spring and summer. Still we managed to set the traps ready for the night ahead. I had my left rod to the left of the swim maybe 6 feet from the marginal rushes, the second left was further along the marginal rushes and a bit closer to them than the first, the first of my right hand rods was at an entrance to a very large lily bed, there seemed to be a channel that went right behind this large lily bed between the lilies and the marginal rushes, we had seen carp show from this area when setting the swim up in the afternoon. My right hand rod was going straight out to the edge of another lily bed at maybe half way across the bay. Darrell in swim ten had his right hand rod off a lily bed to the right of the swim, maybe only 40-50yds out from or bank, the rest of his rods formed an arc away from the first, with increasing ranges finishing with his far left rod towards another lily bed at range in front of the swim. The rest of the lads had settled in and got the rods out before dark too, picking spots that also had things to do with marginal reeds and lily beds. Sitting there in the dark, on the first night of a weeks fishing in France, not cold just nice and comfortable in a warm hoody looking out over the lake and one of my rods start to jump and a screaming Delkim breaks the silence. Darrell springs to his feet like a gazelle and I lift the rod into a nice fish pulling hard at the other end of my line, I manage to steer the carp between the other lines despite the normal banter of easy, keep the rod tip up, looks like a nice fish and so on. Darrell has the net in the water ready for me to guide a nice common over the mesh, when one of his Delkim's start to warble the tell tale sound of a fast take. My carp is in the net and Darrell is playing a nice carp in the next swim, so I secure my landing net in the margin complete with a big common carp and take my place next to Darrell and start to give the same old banter about easy son, keep the rod up etc etc. I net an even bigger common for him when another of my Delkim's springs to life. Back in swim 11 (I must just say at this stage, these two swims are right on top of each other and really form a double swim joined by a small wooden bridge) I'm connected to a carp that is not too happy in having his feeding spell disturbed by being hooked, now remember Darrell has a big carp in his landing net and I already have one in mine! A quick buzz on the walkie talkie to Steve (we always take walkie talkies with us to France, they help to keep in constant contact with each other throughout the week) results in him standing beside me ready to net a nice mirror. On the scales we had me with a common of 34lb and a mirror of 32lb. 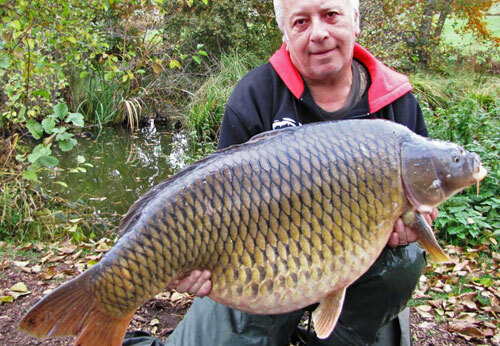 Darrell's common pulled the scales down to an impressive 41lb. What a start!!!!!!! Three runs and we couldn't have been fishing much more than a couple of hours, Darrell with a new pb common at 41lb and beating my pb common of 39lb caught a good few years earlier. The funny thing is we were talking during the long drive to the lake about pb's and although Darrell's pb is 47lb he really wanted a forty common more than beating his overall pb and here we were first fish job done! It's a shame that while Steve had come up to our swim to help with the netting of the third carp, one of his rods had a take which Pete played and landed, it was a thirty odd pound mirror, I think they took a quick pic but then slipped it back. Thanks again Steve for bringing up the net, you was well rewarded mate a bit later with a 38lb mirror and later on in the week with that rather special common, more on that later! It's funny really, we come on these fishing holidays to catch carp but when it all kicks off like this we end up saying things like 'lets hope it doesn't keep going like this all week' we will end up knackered!! So is it we want a lot of fish, but spaced throughout the week, preferably during the day (for good pics), with a good mix of commons and mirrors, with different scale patterns? Bloody picky lot us carp anglers aren't we? Anyway back to the fishing, we had all caught the first night except Pete, but then again he did land the one on Steve's rod. The biggest so far had been Darrell's 41, Steve had landed a 38 and Perry had caught a 31, Vincey boy had a 27lb common, so some nice fish for the start of a week. After breakfast on the Sunday we were all fishing again, basically in the same spots as before, the entrance to the channel that ran behind the lily pads was to receive a lot of attention from me as there were carp in the area most times of the day, I didn't want to go too far into the channel in fear of snagging fish in the lilies but where I was concentrating the bait seemed ok as pretty soon I had another take from this spot. I connected with the fish and walked back a few steps, this was the procedure I adopted with each take when fishing towards the lilies, it seemed to help prevent the carp from getting into the beds of lilies, however due to the fairly shallow water we sometimes saw a vortex rise to the surface actually in the lily bed, so they were getting there but only just! 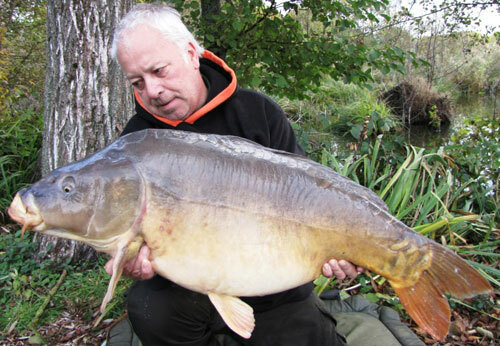 After a few minutes Darrell slipped the net under a nice conditioned, clean 42lb+ mirror. Seemed like we were on a roll! The carp kept feeding and we kept catching em, quite a few mirrors were now coming out in the 22lb - 30lb bracket nice clean stocky carp, I'm sure these fish were all from the same source as they did look very similar (the gallery page for Castle lake will show you this) although they were good to catch, we didn't take too many photo's of them as they did all look similar, but as I said lovely fish. 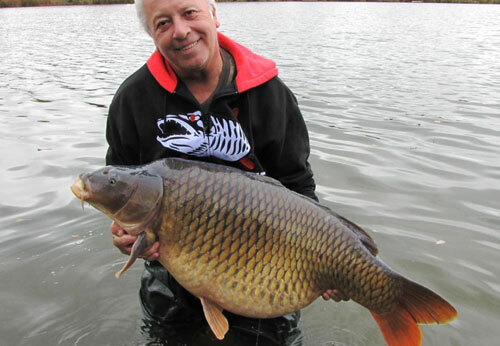 Steve had a fish of a lifetime early one morning, the fish of a lifetime in this case was a beautiful common carp weighing at 48lb 8oz and what a looker, I can't tell you how it fought as I wasn't with Steve at the time, but as Steve said, it was one of those fights when you just know it's a big fish, slow plodding, powerful lunges, just like all the really bigguns fight like. But of course it doesn't have to be a monster carp to fight like something possessed as we were to find out later in the week. I had a take from my "banker" spot again, (you know, the entrance to the channel behind the lily bed) and this fish just kited all along the edge of the lily bed and kept going without me able to gain any line. This fish was intent on making a visit to the brothers grim in swim 19 and it was my job to prevent it! After the fish had travelled maybe 100yds from my left straight across all the other lines and was now starting to cross Darrell's lines we decided to jump into the boat. Darrell got the boat to the side of the swim and I jumped in, holding onto the rod and grabbing the landing net. Darrell started to row towards the fish with me reeling down keeping a good bend in the rod, I honestly thought we had a real big fish here, then I glanced a long golden back of a common carp, it looked big, but how big we didn't know, after a few more minutes of spinning the boat round we managed to net the fish and started to row back to the bank. It was one of those really long slender commons, all muscle and no fat, a fish that could be a very big fish if it did fill out, it weighed just over 30lb and in immaculate condition, a real fighter! I think it was at breakfast on Wednesday morning, Tuesday night had been quite for all of us with only one or two fish out, when Vincey boy suggested a match in the other lake (Castle lake 2) this is a much smaller lake with only about 6 swims, it's described as a runs water, but it does contain some very big carp along with plenty between 25 and 30lb. The teams were the old DIA crew, me Perry and Steve against the others, Darrell, Pete and Vincey boy, only one rod each and each team in only one swim and no stalking. We decided to only fish the middle swims on the lake, a toss for which swim was won by Vincey boy who opted for a nice comfortable area with a few features on the opposite bank. Strange really cause our swim also had some nice features on the opposite bank too. I went tight to the far bank in the middle, Steve went half way across on the right and Perry went 3/4 across on the left. after about 30 minutes a carp swirled to our left jus a few yards from our own bank, Perry looked at the swirl and carried on sitting there, I said reel in son whack this PVA bag on and cast to it. About 10 minutes later the rod whooped round to the left as a carp ran with Perry's bait. 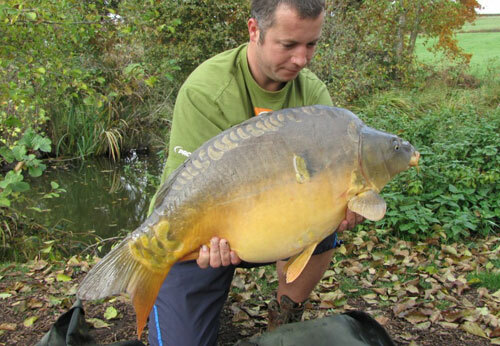 After a very spirited fight the net was slipped under a nice golden mirror carp of 28lb. One nil to the DIA crew! I had a hook pull and so did Darrell for the others, so we won the match. A rematch was arranged for the next day which again we won with a bream. I did lose a very nice carp right at the net, when it caught us by surprise and snapped brand new 15lb line like cotton, for some reason the clutch was tightened to the max and on such a short line I didn't stand a chance. Well the match had been won, so the time had come to return back to our main swims to bait up ready for the evening, then have our evening meal. But on the way back Darrell, Steve and I decided to have one quick dabble in the corner swim of lake 2, we had seen a few fish in this part of the lake each time we passed. Darrell dropped a bait just off a overhanging tree to the left of the swim, Steve cast his bait a bit further down into the corner and I cast mine complete with a small PVA bag a bit further still where other overhanging trees draped into the water. Ten minutes later before the buzzer sounded I hit the rod as the tip started to pull round. The fish tried to get under the trees between where I first hooked it and the swim, all the way back to the net, but Darrell was there waiting to scoop the angry carp from it's watery home. 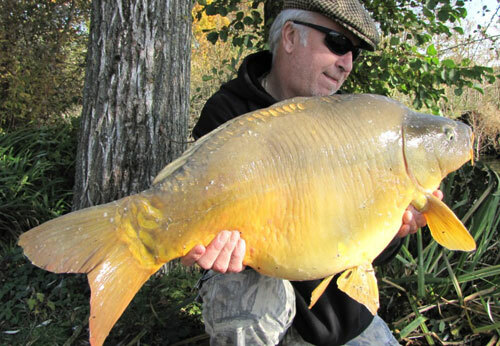 A very long, lightly scaled powerhouse of a carp that weighed just under 30lb. So back to our swims to get ready for the night ahead. After another great meal supplied by Janet we were ready to catch a few more before we were due to make the long journey home. Friday saw us all catch a few, some bigguns too, remember my banker spot? Well I kept baiting this spot and catching fish from the area consistently, but a lot of the fish were now under the 30lb mark, why the smaller fish had moved into the area I don't know but I kept the bait going in, just as well as the next take was from a much better fish this again just plodded around trying to keep as much distance between us as possible. After a few minutes Darrell slipped the net under a very big common carp which looked very big indeed when laid on the unhooking mat, we unhooked it and steadied the scales which read just over 47lb, yes a new pb common for me, 47lb of beautiful common carp 8lb up on my previous best common. After a fish like that I was ready to pack the gear into the car and start the drive back!!! 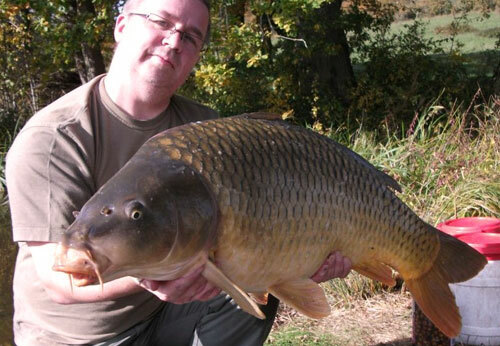 But who knows maybe there was a chance to beat my overall pb of 51lb 12 oz? Or perhaps somebody else might catch another whacker? I did manage another fish and talk about a last minute chance? Darrell and I had packed away most of the gear as we had to be away early on the Saturday morning due to Darrell's flight back to Sweden, which was from Barcelona at about 6pm, which meant I had to get him there not much after 5. We shared my two man bivvy for the night and reduced the rods to three each both fishing from swim 10, me to the right with all three at long distance delivered by the bait boat and Darrell fishing my 'banker' and other spots around the lilies straight out in front of the swim. I had a thirty during the night which was my last fish of the week and managed a good nights sleep, Darrell managed just the good nights sleep! As we were packing the last of the bits away, Darrell still had two rods resting on the front of the swim, one of the baitrunners started clicking away, he thought I was messing around and just said "yeah alright Dad", then saw I was nowhere near the rod. He started to play the fish to the bank but the hook slipped out, just out of reach of the landing net!